He installed Ezekiel Kondo Kumir Kuku as the country’s first archbishop and primate at a ceremony in the capital’s All Saints Cathedral attended by American, European and African diplomats as well as hundreds of worshippers. Previously, the Episcopal Church of Sudan and South Sudan administered the region, Reverend Francis Clement of All Saints Cathedral told AFP. 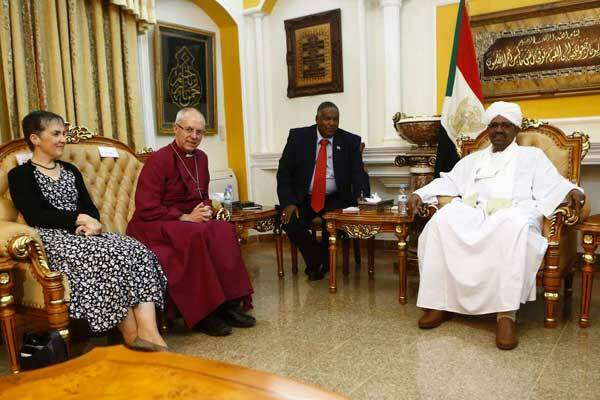 “But after the split it was decided to have a separate, autonomous Episcopal Church of Sudan,” he said. There is no central Anglican authority such as a pope, with each member church making its own decision in its own ways guided by the Archbishop of Canterbury. Human rights and Christian campaign groups have regularly accused the Sudanese authorities of persecuting Christians and even destroying churches in the capital since the north-south split. About three years ago two South Sudanese pastors, Yat Michael and Peter Yen, were arrested in Sudan on charges including spying and crimes against the state. The two, arrested by agents of Sudan’s powerful National Intelligence and Security Service (NISS), were released by a Khartoum court in August last year. Later on Sunday, Welby met Bashir with whom he discussed issues concerning “protection” of Christians and churches in Sudan. “We talked of how in England we seek to help mosques in ensuring that they are able to function well and freely,” Welby said. “In England, the Church of England often seeks to protect Muslims when they are under pressure,” he said, indicating that he expected the same in Sudan when it came to protecting Christians. Christian communities in Sudan today are mostly found in the Nuba Mountains of South Kordofan state. Experts say that between three and five percent of Sudan’s about 25 million population are Christian. Several campaign groups have urged Washington to maintain the sanctions or formulate new ones to address concerns over human rights violations, including alleged religious repression.